Nash-Kelvinator Corporation head George Mason hadn't cared much for the original Nash-Healey's styling -- with its slab sides and tall, two-piece flat-pane windshield. Accordingly, he ordered a restyle for the 1952 Nash-Healey and handed the job to Pinin Farina, the renowned Italian designer he'd recently hired to do the all-new Ambassador and Statesman that would also appear for 1952. Farina's carrozzeria in Turin would also build the bodies, a change that only added more international mileage to Nash-Healey production. Another advertising shot, this time a 1952 Nash-Healey minus the circular Nash grille badge fitted in production. Green upholstery coordinates well with the red exterior, but only for Christmas. As before, engines and drivelines were built in Kenosha, Wisconsin, boxed, and shipped to England, where the Healey works continued to fabricate the frame and complete the rolling chassis. This was then shipped to Turin, where Farina craftsmen fashioned the bodywork by hand and took care of final assembly. The finished cars were then shipped to U.S. ports of entry. Warm and gracious, Pinin Farina looked more like a well-dressed banker than the masterful and innovative automobile body designer he was. He came to the United States twice before Nash started production on the full-size 1952 models he had designed. "I was assigned to be his unofficial host on both occasions by George Romney, then Nash-Kelvinator executive vice-president," says former Nash PR man John A. Conde. "Farina spoke little English, but he wanted to see the sights around Detroit. We ended up attending a baseball game and touring Greenfield Village, the General Motors office complex, and the Ford Rotunda with his English-speaking son-in-law, Renzo Carli (who is still with the firm, which was renamed Pininfarina after the designer's death in the early 1960s to distinguish it from another concern owned by Pinin's brother)." 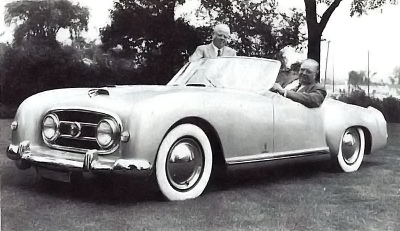 George Mason tries out the 1952 Nash-Healey roadster as Italian designer Pinin Farina looks on. 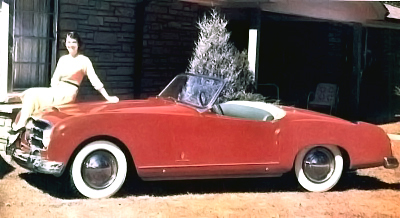 The car would keep this basic look through the end of production in August 1954. Farina's most important American visit began on February 13, 1952, when he arrived in New York aboard the Ile de France. Within a week he was the star of the Nash national dealer show in Chicago. That was when dealers got their first look at his new Ambassador and Statesman, while the revamped 1952 Nash-Healey was displayed at the Chicago Auto Show that was going on at about the same time. "I recall sitting at a luncheon table with several Iowa dealers and their wives as Farina was introduced by Nash sales vice-president H.C. Doss," says Conde. "One dealer turned to me and expostulated, 'Hell, all I can sell is the Ambassador. That little Rambler won't go with farmers where I live. And as far as I'm concerned, Farina is nothing but chicken feed.' Fortunately for the company, this low opinion of one of the world's foremost car designers was not typical of Nash dealers." Adding Farina's Italian flair to American components and British engineering made the 1952 Nash-Healey an extremely pleasing international blend. Although the body was still rounded, it was more visually interesting. Notable styling highlights included a simple oval grille with the headlamps mounted inboard, as on the Farina-designed senior Nashes, plus a slightly curved and shallower one-piece windshield and pronounced rear fender bulges that broke up the slab sides. The body was now made entirely of steel, yet careful engineering actually reduced curb weight. Price went the other way, leaping to $5,868, which was more than $1,500 higher than for a 1952 Cadillac Sixty-Special. Nevertheless, production rose to 150 units for the model year. Nash added several adjectives to describe the powerplant, dubbed "Le-Mans Dual Jetfire Ambassador Six" in honor of the car's racing exploits. During the year, a larger 4.1-liter/253-cid six arrived with 8.25:1 compression, domestic Carter carburetors instead of the British SUs, and 135 bhp, still developed at 4,000 rpm. This engine would continue through the end of Nash-Healey production. In usual form, the Nash-Healey hit the racetrack for the 1952 LeMans 24 Hour. Find out how it fared on the next page.